Bees sting only when they are provoked, for to do so means their death. So if you have a lot of angry bees around you, the best thing is to move away! However, if a bee lands on you and is angry enough to sting you, then just before they sting they will arch their back and rub your skin with their tiny tail and leave a small amount of pheromone – which attracts other bees to sting in exactly that place! If you are quick, you can feel the bee rubbing itself on your skin and knock it off before it stings you! If you can prevent it from leaving the pheromone – even better. I am told that this is why bears hate bees so much – because one stung, the bees keep stining in the same vulnerable area….so there is a multiplier effect. Clever bees! If one does manage to sting you, then the sting has barbs, which allows the sting to enter the skin and stay there. Unfortuantely this literally rips out the insides of the honey bee – which (unlike a wasp), will kill the bee. It also leaves a small venom sack attached to the barb that will, over time, self-inject imore venom nto the skin (it has a tiny muscle that will go on contracting even though the bee has fallen away!) I have found that if you get stung, then you should scrape off the small black barb from the wound as soon as you can with of one of your fingernails or a hive tool. It greatly reduces the effect of the sting – because the venom sack does not have a chance to inject all its venom into the skin. 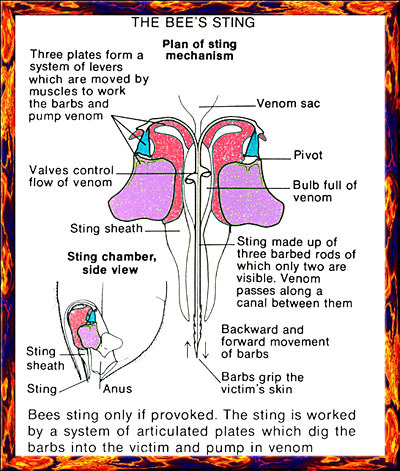 Below is a diagram of how the bee-sting works.